...But I am saying WHY NOT?! I have decided to embark on yet another journey! With my plate already full with Girl Scouts, Box Tops and my Thirty-One business, I have had to make the switch to an overflowing platter! I am in the process of starting up another business: Perfectly Posh! This past weekend while at a vendor event, I was reintroduced to some amazing products that I love, and while I can't quit explain it, it felt like just the right time to start something new. So I snagged some stocking stuffers from the Consultant, and grabbed some paperwork on the business opportunity. And the next day...BAM! I am now an Independent Consultant with Perfect Posh! So what is Perfectly Posh? Well, let me introduce you to your new favorite products! As a company that was founded in 2011, it is taking off with huge leaps and bounds! Their motto is "We Simply Pamper", and the products are great! 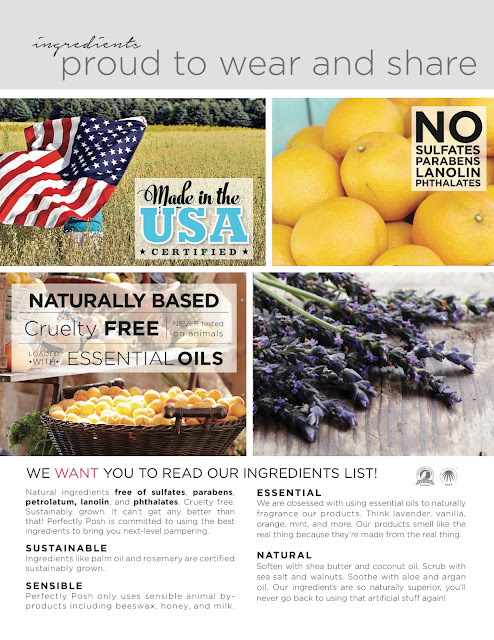 They are made in the U.S.A, with all natural ingredients. And the company in fact, wants you to read the labels...the proof is all there! moisturizers, various facial treatments, from lip scrubs to balms, shampoos and conditioners, foot care, and a line of products just for men! I am telling you, they have it all, and it is all freakin' amazing!! And you wanna know the best parts? Every single products is $25 and under! They have a flat $5 shipping fee! There is always a Buy 5, get the sixth Free deal! AND, they have a Perks Program, where you Earn points with every purchase, and then you get to Spend the points on FREE product! So the point is: if you like skin care, and you like to treat yourself, I'm gunna have to say that these products are just what you've been looking for! If you don't believe me, check it out HERE!